Profile of the 11,500-dwt tanker ordered from Valmet Shipbuilding by Oy Shell Ab. Shell Ab, the Finnish subsidiary of Royal Dutch Shell. Finland placed by the Shell Group. Jaakko Ihamuotila and Shipbuild- ing Group's vice president Rauno lives. The vessel will be built at Val- met's Helsinki shipyard in Vuo- saari, where Oy Shell Ab's main office is located. Construction work will begin this year, and delivery is scheduled for the end of 1981. The new ship will have a length overall of 141 meters (about 463 feet), breadth of 21.2 meters (70 feet), a depth of 10.7 meters (35 feet), and a draft of 7.8 meters (26 feet). Total loading capacity of tanks will be 14,000 cubic meters. The machinery consists of two me- dium-speed engines giving a total output of 7,500 bhp connected via reduction gear to a controllable- pitch propeller. The speed of the new vessel will be 14 knots. Oy Henry Nielsen Ab, and will have a Finnish crew. Construction will be according to class + 100 A-l of Lloyd's Reg- ister of Shipping and will also meet the requirements of the Fin- nish Ice Class I A. This contract will result in Val- met's first direct delivery to Shell. Valmet Oy were time-chartered, during construction, to Shell. Two hundred forty-five vessels of more than 10,000 dwt are cur- rently operated by Shell, making it the largest individual fleet in the world. The Shell fleet carries 12 million tons of oil daily. This equals the annual total consump- tion of oil in Finland. Washington iron Works is more than a single service operation. We offer a large foundary capacity, provid- ing single castings up to 20,000 lbs. and welded con- structed castings currently in excess of 65,000 lbs. in addition, we provide the finest in machining, fabrica- tion and assembly to satisfy your most exacting re- quirements. Finally Washington Iron Works backs these services with a complete engineering staff-to insure a quality product that works right" each and every time. 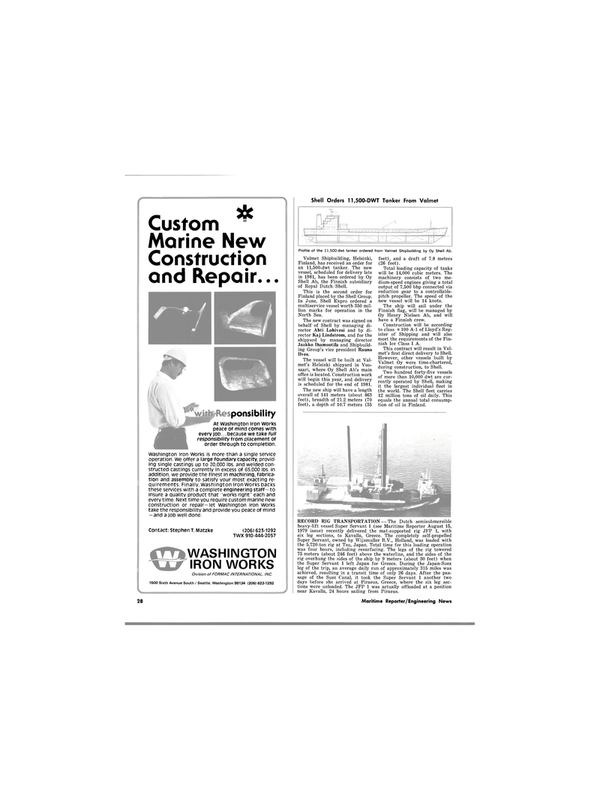 Next time you require custom marine new construction or repair-let Washington iron Works take the responsibility and provide you peace of mind -and a job well done.